The ultimate comparison: Ludurana vs. Ozotic! Today it's the ultimate comparison between Ozotic 504, 505, 506 and Ludurana Emocionante, Show, and Reluz. If you missed my previous post comparing Ozotic 504, 505, and 506, click here and for the comparison between Ludurana Emocionante, Show, and Reluz, click here. Ozotic 504: main colors are royal blue-deep purple, you can also see some copper, red, burgundy, and orange. Ozotic 505: main colors are green and purple , you can see some copper at certain angles. Ozotic 506: mains colors are cyan and purple. Emocionante: main colors are royal blue-deep purple, you can also see some copper, red, burgundy, and orange. Show: main colors are green/teal and purple, you can see some copper at certain angles. Reluz: mains colors are cyan and purple. => Do we have some dupes then? 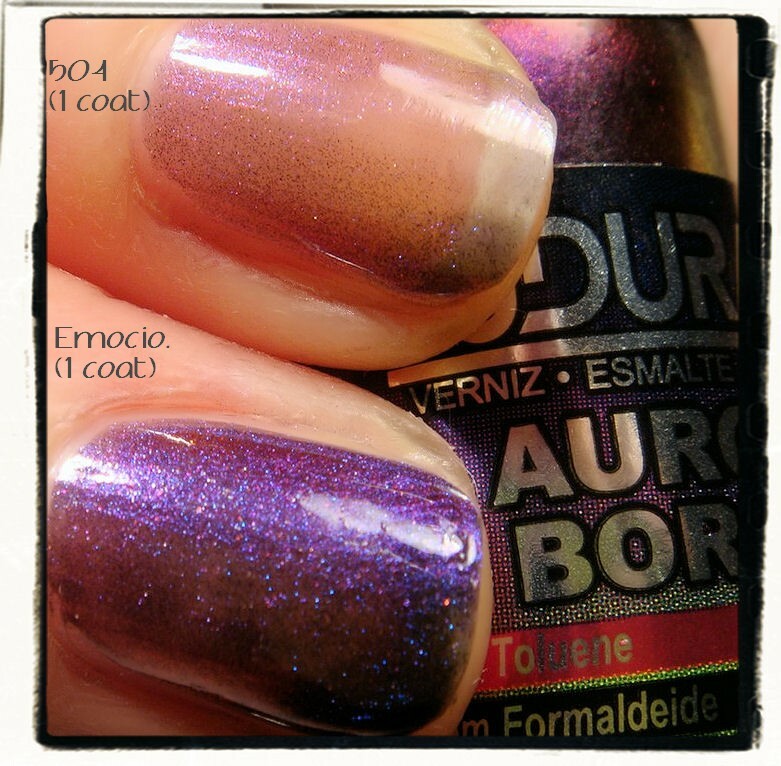 First, let's compare Ludurana Emocionante with Ozotic 504. On the index, it's 2 coats of Ozotic 504, 2 coats of Emocionante on the middle finger, 2 coats of Emocionante over A-England Lancelot (very dark red almost black) on the ring finger, and 2 coats of Ozotic 504 over black on the pinkie. Ozotic is quite sheer. Even with 3 or more coats, you cannot reach full opacity, it gives a jelly look. On the contrary, Emocionante is fully opaque with 2 coats. 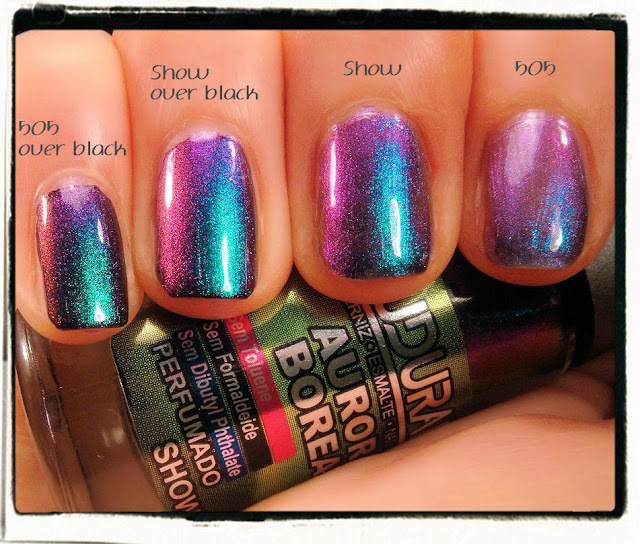 However the colors in both polishes are the same: deep blue and purple with copper and burgundy. Then let's compare Ludurana Reluz with Ozotic 506. Here again, the Ozotic (506) is sheerer with a jelly look. When they are layered over black, the have exactly the same shif in colors. Finally let's consider Ludurana Show and Ozotic 505. It's the same again. 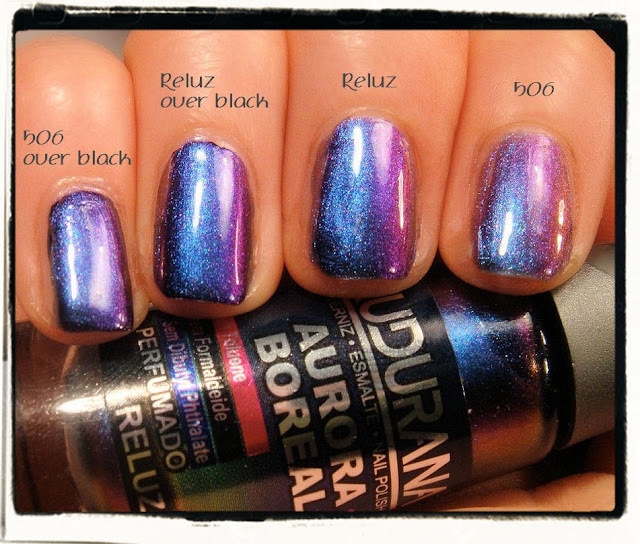 Ozotic is sheer while Ludurana is opaque with 2 coats. Both polishes display the same range of colors. On the above picture you can see the difference in terms of opacity between Ozotic (504 here) and Ludurana (Emocionante here). Both are 1 coat over bare nails. Final verdict: The different Ludurana-Ozotic couples (Emocionante-504, Show-505, and Reluz-506) possess the same range of colors and are thus very close. Emocionante and 504 show both royal blue-purple-red-copper, Show-505 green/teal-purple, and Reluz-506 cyan-purple. The only difference between them are the opacity. 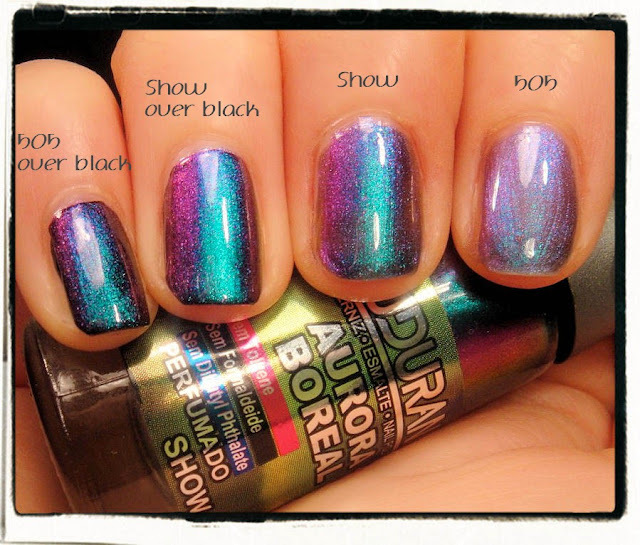 Ludurana polishes are lot more opaque than Ozotic. That's why you can use Ludurana by themselves while it's better to layer Ozotic over a dark base. What is also super fun is that you can stamp with these Ludurana multichromes (cf my post about it). So if you prefer opaque polishes and love stamping, I suggest getting the Ludurana while if you like trying different layering combinations, Ozotic polishes should be your choice! Their price is also a little different. 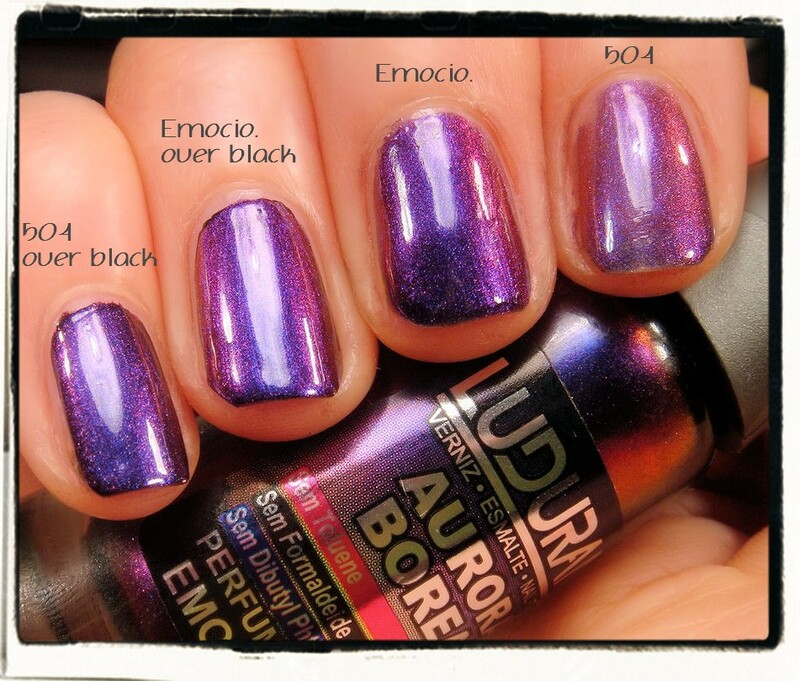 Ludurana multichromes cost $14.0 for 8mL (1.75/mL) and Ozotic are $17.5 for 15 mL (1.17/mL). 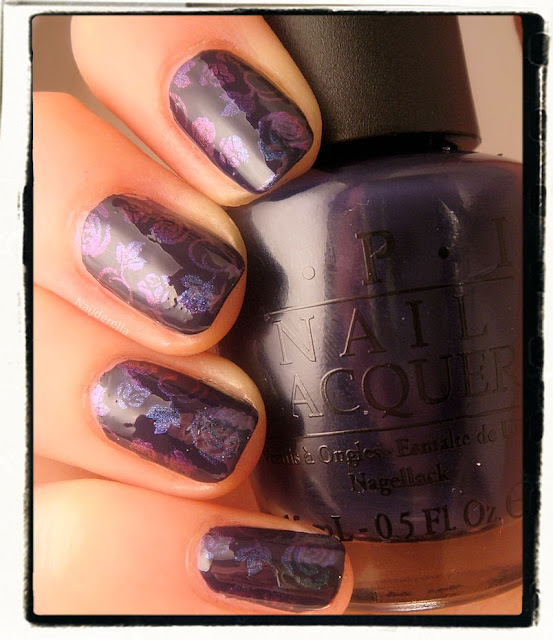 PS Not all Ooztic polishes are sheer. Here I'm only talking about 504, 505, and 506! Ozotic 520 and 507, for example, don't need to be layered over a base color. Stamping with Ludurana - Show over OPI Road House Blues. Full post for this mani: here. Ozotic and Ludurana polishes can be purchased from Llarowe. This is the US stockist for Glitter Gal, Ozotic, Picture Polish, A-England, Hits, Ludurana, and Lynnderella polishes. They sell internationally and have an awesome customer service. You can visit Llarowe on Facebook.